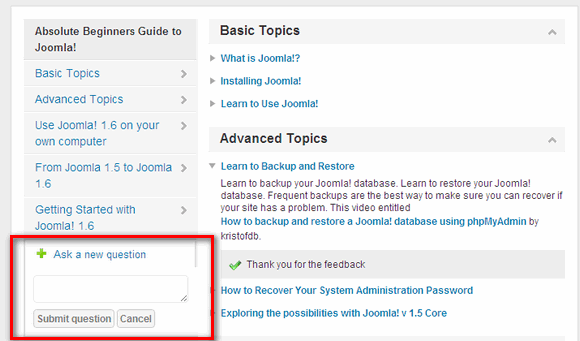 How to create a FAQ page in Joomla? FAQ (Frequently Asked Question) pages have become commonplace on many websites for many reasons. Many FAQ’s focus on how a website or the service it provides works or offerings. This type of page always has a main block of questions, each of which is linked to an answer that can be either on the same page (better solution) or on a new page. Luckily I found an extension that can deal very quickly with this task. Minitek FAQ Book (www.minitek.gr) is a new Frequently Asked Questions directory component, designed with the Joomla! 1.6 MVC Architecture. He utilizes the jQuery library, delivering smooth sliding and accordion effects. You can use it also as a directory or a documentation component. FAQ Book is free, based on GNU General Public License 2, so you can change code as you want. FAQ Book uses the jQuery library for smooth sliding-accordion effects. jQuery no-conflict mode for seamless use with the Mootools library. Ajax voting system for each FAQ item. Back to top link after each answer that points back to the questions area to make your page easy to navigate. Users can submit their own questions using a special box (see picture above). Creating a FAQ page should enhance the usability of your site, providing your users with all the necessary information (in one place) on a given topic in a concise. Accordion FAQ page means the user can easily navigate between categories, questions and of course answers, without having to spend ages scrolling through search pages. A large number of responses will reduce the number of emails with questions, so it’s worth.